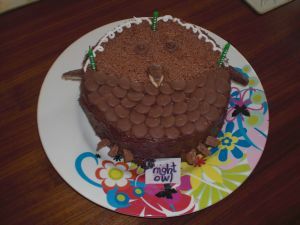 Continuing our series of Kids Cake Ideas, Karen, mum of 2, put together this delicious looking Owl Cake. If you are looking for birthday cake ideas for girls that are a bit different and non-pink, this will hit the mark! Equally suited for your little “prince” also! One of my kid’s favourite books is the Owl Babies, my 10 year old still loves it, so when I saw this I had to make it for her birthday, she also only likes chocolate cakes so this did the job. Chocolate vermicelli / tube of white writing icing. 2 x 23cm round tins, greased and lined on the base. Piping bag with star shaped nozzle. Cream the butter and sugar together until light and fluffy. Gradually add beaten eggs. Add vanilla extract. Sift together plain flour and baking powder and add to cake mixture in 2 batches. Add milk and mix until smooth. Divide mixture into 2 round cake tins. Bake on the middle shelf for 30 – 35 mins. ( You will know your own oven so check near end of cooking time). Leave to cool for 10 minutes in tins before turning out onto a wire cooling rack. Mix all of the ingredients until nice and smooth. 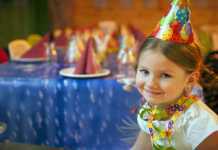 You will need icing for the cake and decorating. Sandwich 2 cakes together with chocolate butter icing. Cover the top and sides with icing using a palette knife to get it nice and smooth. Arrange chocolate buttons over the bottom of the cake to resemble feathers, cover the top half with vermicelli, use buttons and 2 dots of white writing icing for eyes. Use pieces of flake for feet, cut pieces of twix for wings and nose. Fill piping bag with remaining icing and pipe feathers around the owl’s face.